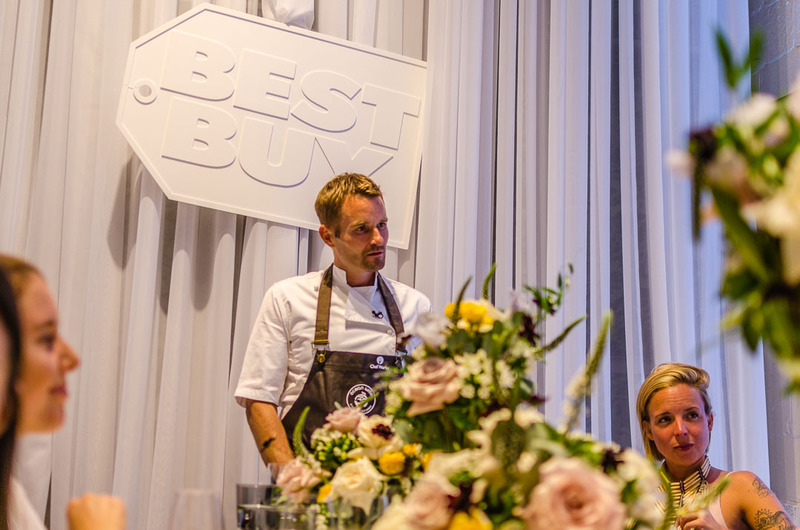 Last week, Best Buy Canada hosted SAVOUR, an intimate midsummer pop-up with Executive Chef Ned Bell. 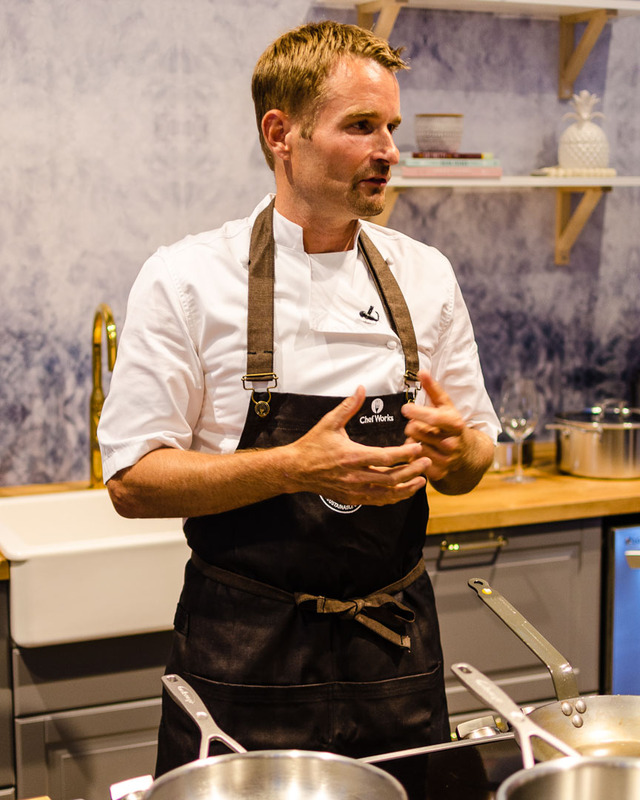 Chef Bell prepared a delicious four course experience using smart appliances from LG, KitchenAid and Vitamix. 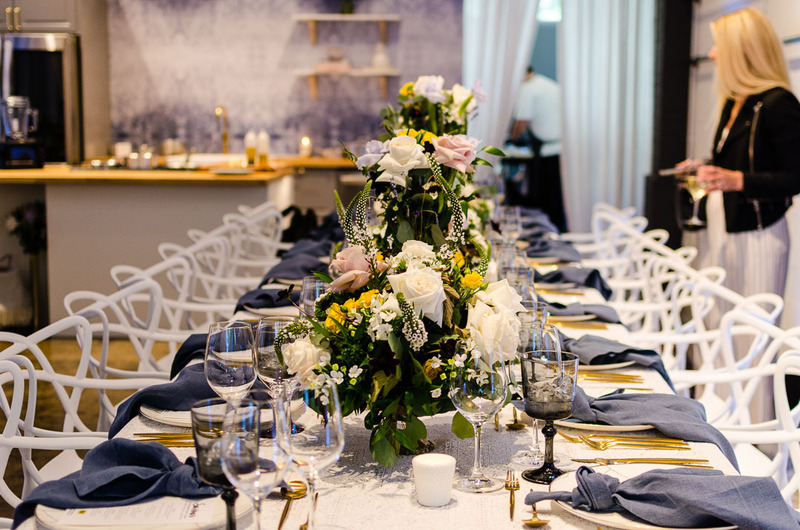 Designer Aly Armstrong transform a warehouse space into a beautiful summer floral setting. Aly shared her tips to creating a stylish kitchen such as adding pops of colour using countertop appliances and replacing old cabinets with open shelving. 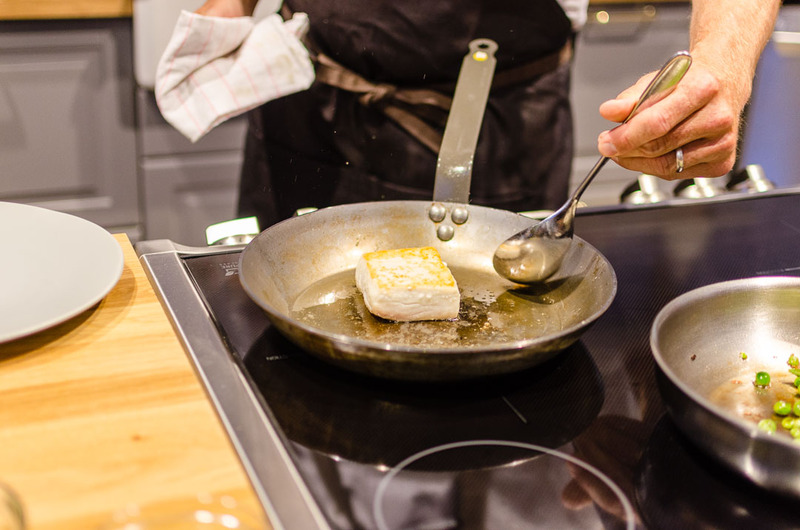 The evening started with a halibut cooking demonstration using the LG 30″ Self-Clean True Convection Freestanding Smooth Top Induction Range. The ProBake convection technology delivers precise heat on every rack because the heating element is moved from bottom to the back wall. With an induction range, you can cook faster and safer because there’s no open flame. Chef Bell recommends using a high quality stainless steel pan as it will cook your food evenly. Plus, stainless steel pans are very durable and scratch resistant. 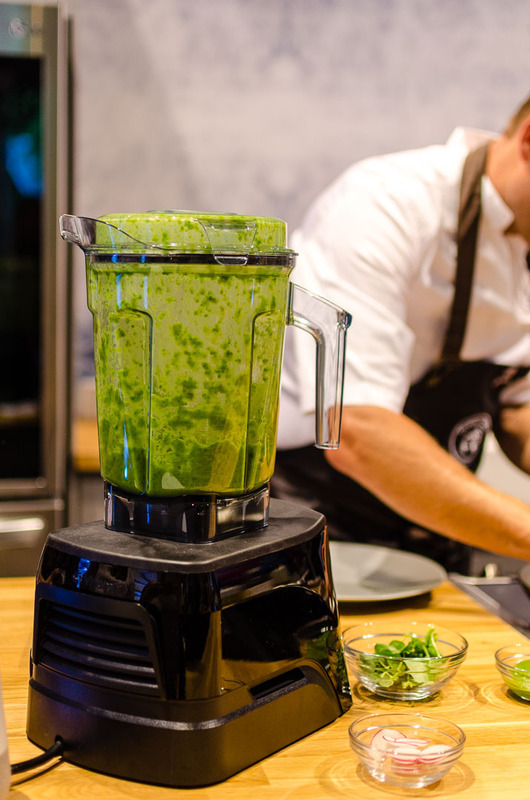 For the pea puree, Chef Bell mixed the peas, spinach, olive oil and whipping cream into the Vitamix Ascent 2300 1500-Watt Blender. It features Variable Speed Control and a Pulse function, so you can create the precise textures again and again. Fresh peas taste just like spring—green, grassy, and sweet. Since their season is short, I try to make the most of it by cooking them up every which way. In this dish, they’re cooked into a silky puree and sautéed until just-tender. Then I use their delicate tendrils for a simple salad. 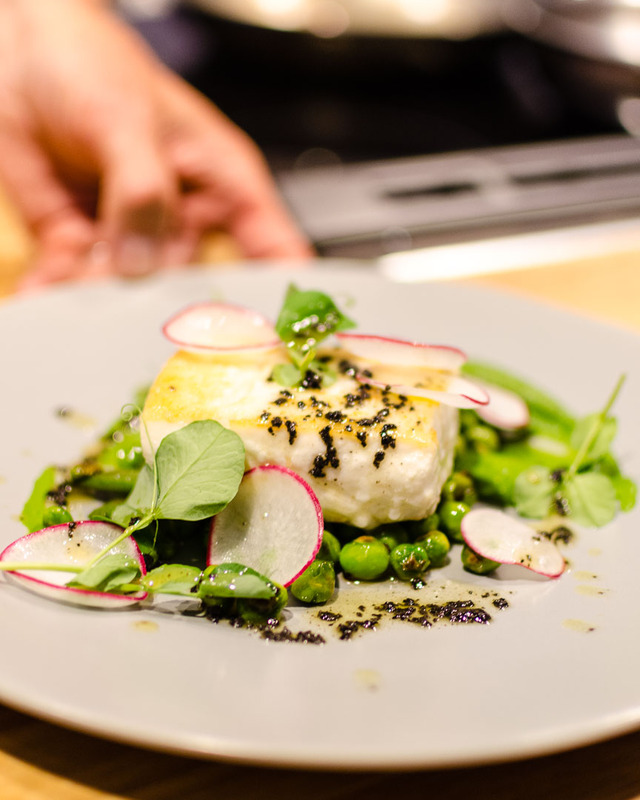 It’s a springtime trio that would be delicious with any fish, but since halibut fishing begins right around the same time as pea season, I can’t resist bringing these two elements together on one plate. 1. Heat the oil in a large saucepan over medium heat, add the shallots and salt, and sauté for 3 minutes. 2. Add the peas, spinach, and cream, and cook for 1 minute. 3. Transfer the mixture to a blender, puree until smooth, and strain through a fine-mesh sieve. 4. If necessary, add up to 1/2 cup warm cream to thin out the puree (I prefer it quite thick and rich). 2. Add the shallots and sauté for 3 minutes. 3. Add the peas, season with the salt and pepper, and cook for another minute until the peas are tender. 1. In a bowl, toss the pea shoots with the oil and lemon juice. 1. Use paper towels to pat the fish dry, and season with salt and pepper. 2. Heat the oil in a heavy-bottomed, ovenproof skillet over medium-high heat until almost smoking. 3. Carefully lay the fish in the pan. (If necessary, cook the fish in batches to prevent overcrowding, which will keep the fish from caramelizing properly.) 4. Reduce the heat to medium and cook for 2 minutes; a golden crust will have formed on the flesh. 5. Reduce the heat to medium, flip the fillets over, and add the butter, the thyme, and a squeeze of lemon over each fish. 6. Cook, basting with the buttery juices, for another 3 to 4 minutes or until browned and almost opaque all the way through. Transfer the fish to a plate. 7. To assemble, spread the spinach-pea puree on each plate. Add the sautéed peas and place the halibut on top. Garnish with the dressed pea shoots, lemon zest, and coarse sea salt. Serve. In a large container blend all ingredients together using the KitchenAid Immersion Blender. 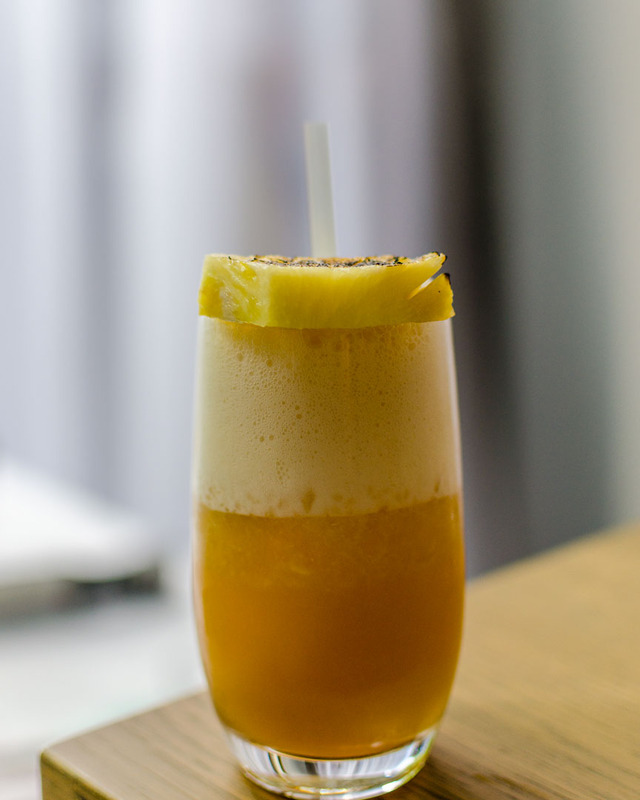 Garnish with a torched golden pineapple and a lime wedge. Pour into a rocks glass. 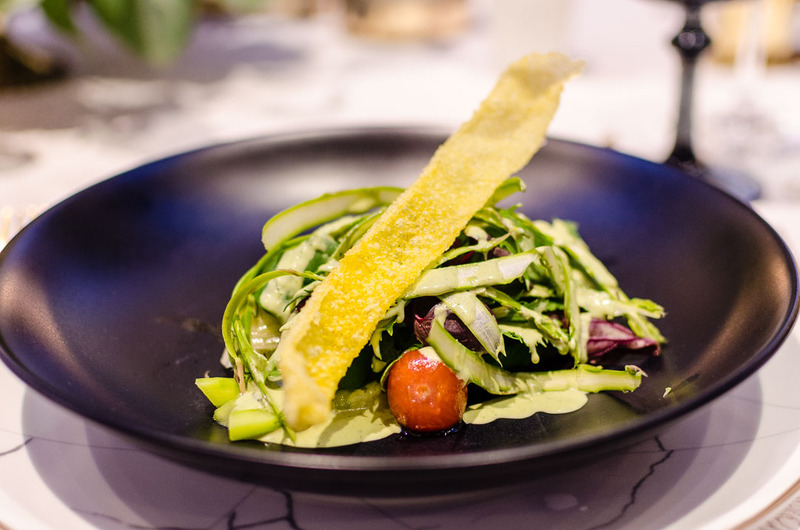 The first appetizer was Local Asparagus Salad with Spring Lettuces and Green Goddess Dressing. 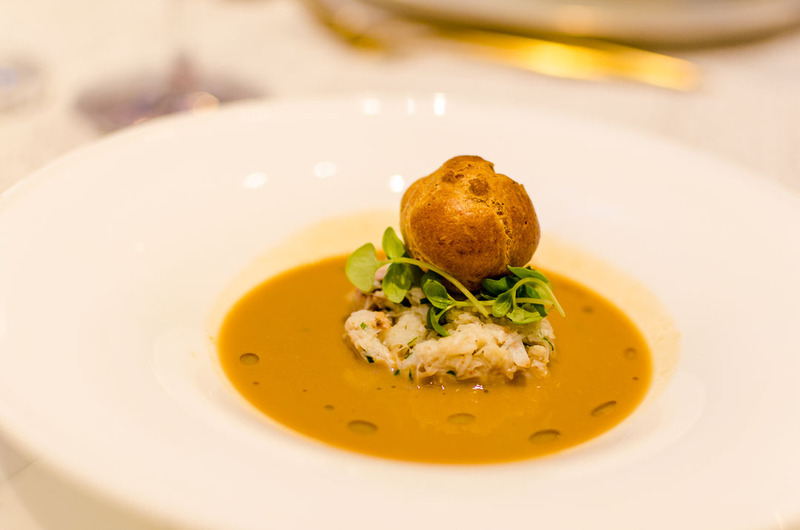 The second appetizer was Crab and Coconut Soup with Lime and Chilis. 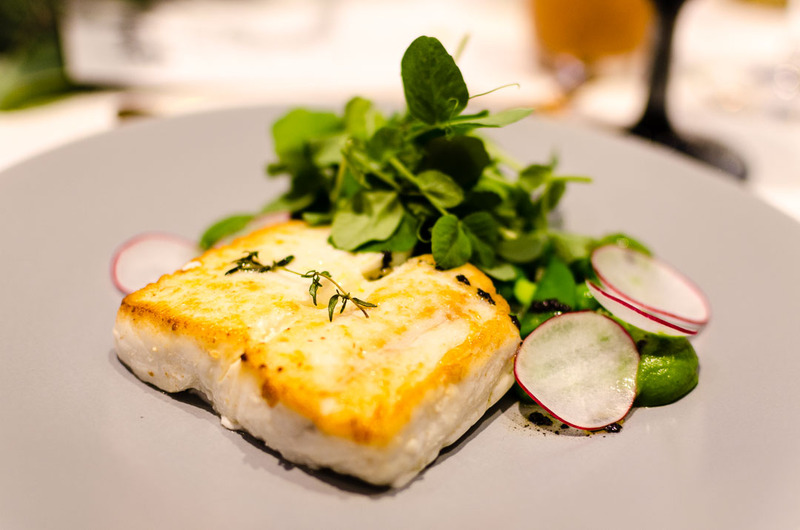 The main course was Halibut with a Composition of Peas and Truffle Dressing from the cooking demo. We ended the night with Chef Bell’s famous (sea)weed brownie. 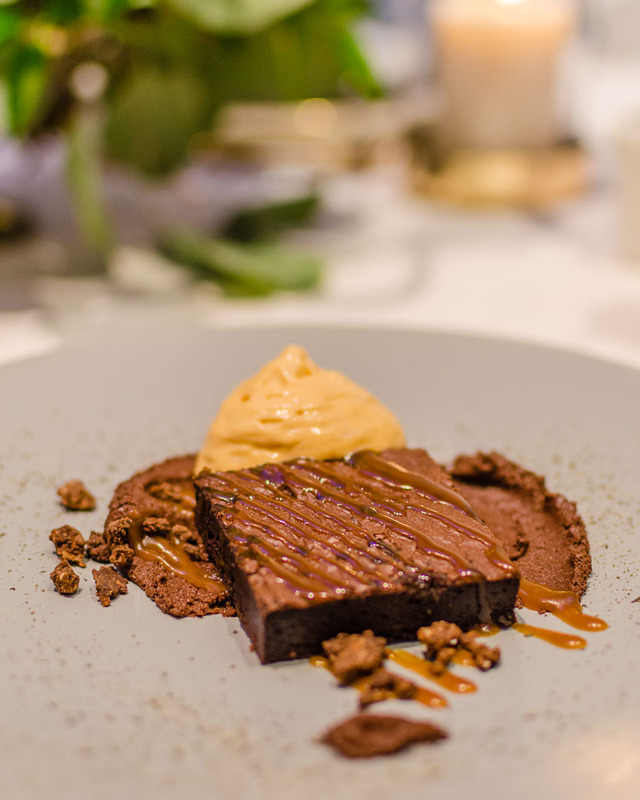 Seaweed and Milk Chocolate Brownie with Salted Caramel Foam. Technology-integrated kitchens are the biggest trend of 2018. They allow you to control settings and receive notifications from your mobile device, save and conserve money and energy, and communicate with one another, while looking stylish all at the same time. Adding splashes of colour with appliances can create eye-catching focal points and make kitchens more exciting. For those who have smaller kitchens and limited storage space, it’s a great way to turn countertop items into usable works of art. If your cabinets are old and outdated, one of the easiest and most cost-effective solutions is to paint them. For a modern look, try this year’s trending colours—variations of greys, blues and greens. Be sure to keep your large and small appliances in mind when selecting colours, and make sure they match or complement one another. If your cabinets are tired, tear down a handful of upper cabinets and replace them with open shelving. This will allow you to show off your gorgeous dishware, stylish small appliances or add seasonal décor for quick new looks. For an extra pop of colour, add wallpaper to the wall behind the shelves so it becomes a focal point in your kitchen. 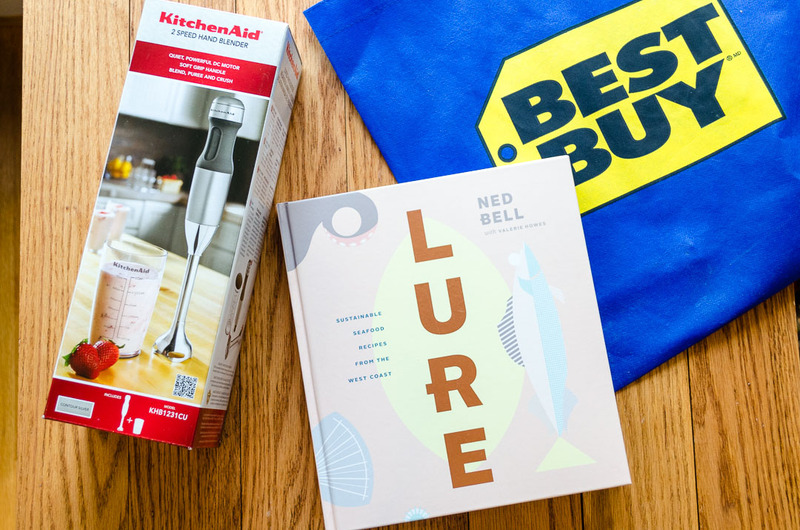 Look for things like accessories, dishware, wall art and appliances to revamp your kitchen. By adding accent pieces that have contrasting colours or geometric shapes, you can add a huge visual impact at a relatively low price point.